DK Company collaborates with factories that are committed to increase sustainability in our supply chain and ensuring that working conditions are decent. and we are proud to be part of creating jobs there. and making sure that they work in accordance with the amfori BSCI Code of Conduct. We have a dedicated team in Denmark, China, India, Bangladesh and Turkey who work with sustainability every day. 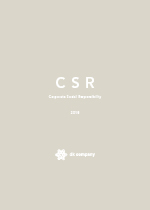 Our CSR Strategy is based on the UN Sustainable Development Goals (SDGs). The United Nations (UN) has ratified a list of 17 goals to transform our world and make it better. These 17 goals are achievable before 2030 and concern subjects such as how to eradicate poverty and hunger and ensure good health, education and gender equality for all. If we all, both as companies and as individuals, do our bit to reach these goals, we firmly believe that they can be achieved. Because there are many women in our line of business. Women sow our garments, a high percentage of women design our styles, and our consumer group is women. about their rights as well as to continuously work towards a higher degree of gender equality in all aspects of our business. Because we know that we work in an industry where there are challenges when it comes to the production of the goods we sell. and how we can reduce this by e.g. making sure our clothes last longer. Because whichever way you look at it, the fashion industry is a polluting industry, and we want to do our bit to make our supply and distribution chains less polluting. our consumption of water and our use of packaging.